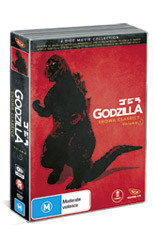 The original monster is back in this entertaining collection entitled Godzilla Showa Classics which is volume 1 of this thoroughly entertaining collection of some of the best Godzilla movies of the 20th century. For the curious, the Showa series of Godzilla ranged from 1954 which was the first Godzilla movie ever and this age ended in 1975 with the Terror of Mechagodzilla. When it comes to monsters, the Japanese really know how to do it best and Godzilla also became the inspiration for many monster movies to come from the 1998 Hollywood remake of Godzilla to Cloverdale and needless to say, it truly became the archetype of things to come. Even though this collection is quite dated with strings, men in suits and some truly bizarre yet sometimes hilarious special effects, the pop culture of this collection is worth the price and I've never seen something so kooky but trying to be serious. My favourite movies in this collection is the original movie that has Godzilla attacking Japan, however we soon discover that this creature was created by a nuclear explosion. As the military attempts to end Godzilla's reign, only one scientist can destroy this creature with a doomsday weapon. Of course many believe that Godzilla only comes with mankind threatens itself with apocalyptic weapons. Another cool movie was Godzilla Invasion of the Astro-monster that puts the spin on Godzilla that he is a protector rather than villain. This time Godzilla battles King Ghidorah, a three headed space dragon. This story also feature some great special effects and the introduction of aliens is priceless to the saga. All the stories, considering are well written and link ancient ancient Japanese myths with the modern world. It's retro science fiction at its best but in order to enjoy this series, you really need the ability not to take itself too seriously. The only let down to this collection is the video quality which is a mixed bag, however for its age, it still manages to capture the wonder of these stories and proves how good the Japanese are at telling stories. If you're after a true pop culture mix of monster stories, featuring our favourite green giant lizard, than Godzilla Showa Classics Volume 1 is definitely for you! Almost 620 minutes of green goodness!